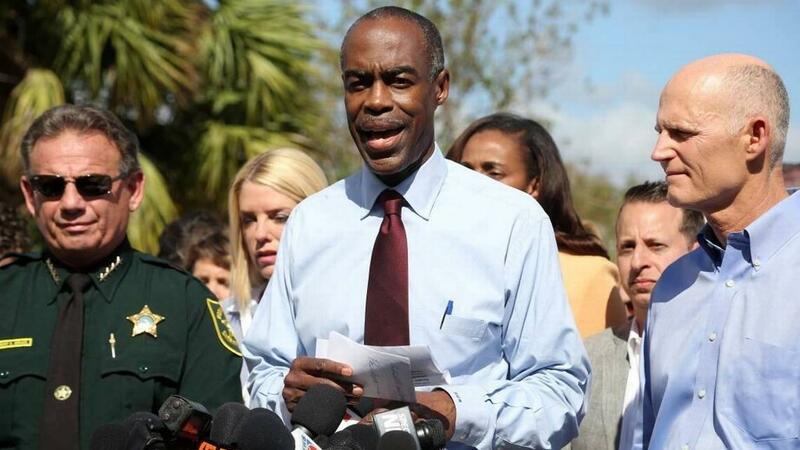 Broward County Schools Superintendent Robert Runcie, center, shown at a news conference after the shooting at Marjory Stoneman Douglas High School with Gov. Rick Scott. After denying for months that Parkland shooter Nikolas Cruz had any connection to a program created to soften school punishment and reduce student arrests — and characterizing assertions to the contrary as "fake news" — the Broward County school district is now acknowledging that Cruz was in fact referred to its PROMISE program. On Sunday, district spokeswoman Tracy Clark told WLRN that Cruz was referred to the program in 2013 after he vandalized a bathroom at Westglades Middle School, located just down the road from Marjory Stoneman Douglas High School. Cruz killed 17 students and wounded 17 more at the high school on Feb. 14. Clark acknowledged the referral after two sources with knowledge of Cruz’s discipline records told WLRN that he was referred to the so-called PROMISE Program for a three-day stint after committing vandalism at his school. According to WLRN, Clark said Sunday that it was unclear if Cruz actually attended the PROMISE program. She said he appeared at Pine Ridge Education Center in Fort Lauderdale — an alternative school facility where PROMISE is housed — for an intake interview the day after the vandalism incident, but it didn't appear that Cruz completed the recommended three-day assignment. Clark, in her statement to WLRN, wouldn't speculate as to why. She said Superintendent Robert Runcie has correctly stated Cruz wasn’t in PROMISE when he was in high school at Stoneman Douglas. In a March 23 editorial, for instance, Runcie pushed back on "fake news" that Cruz was "assigned to PROMISE while in high school." But Runcie hasn't always been specific to Cruz's high school career when referencing the program. And the revelations appear to contradict weeks of assertions by the school board and superintendent that its PROMISE program — an acronym that stands for Preventing Recidivism through Opportunities, Mentoring, Interventions, Supports & Education — played no role in Cruz's student life. Speaking to a state commission investigating the shooting last month, Broward Sheriff's Office Col. Jack Dale also said Cruz didn't attend PROMISE, citing information received from the school board. Questions about the program surfaced quickly after the shooting, as media began to pore over Cruz's disciplinary history and details emerged that showed law enforcement had repeatedly been warned of his violent thoughts and behaviors. For some Parkland parents, and particularly for conservatives who believed that lapses in safety net systems were more to blame for the shooting than the semi-automatic rifle Cruz used in the shooting, the PROMISE program became an important part of the picture. The program allows students who commit any of 13 specific misdemeanors at school to avoid getting involved with the criminal justice system. Instead, they attend the alternative school, where they receive counseling and other support. PROMISE was created in 2013 in response to concerns over the district's numbers of student arrests, and evidence that students, in particular minorities, LGBTQ students and students with disabilities were being disproportionately charged criminally for minor offenses. Clark's admission Sunday was followed by swift reaction from Parkland parents and politicians who'd been assured repeatedly that Cruz never had contact with the PROMISE program. Ryan Petty, whose daughter Alaina Petty was killed in the shooting, slammed the district for a “stunning revelation … that flies in the face of previous statements.” He argued that the news was part of a string of gaffes and failures, and said teachers have been sharing stories about “perverse” and contradictory disciplinary programs that are creating conflicts in schools. “The Broward County School Board has failed in its responsibility as an oversight body. It has forgotten its duty to students, educators and parents,” Petty tweeted. The Broward County School Board has failed in its responsibility as an oversight body. It has forgotten its duty to students, educators and parents. U.S. Sen. Marco Rubio, R-FL, tweeted that he'd been "repeatedly told that the Parkland shooter was never in the Promise program I was asking about. Now it turns out that in fact he was." Rubio late last month called on the U.S. Department of Education and the U.S. Department of Justice to investigate Broward Schools’ use of PROMISE. Rubio also asked federal authorities — who have issued grants to school districts tied to programs intended to soften old “zero-tolerance” policies that studies show increased the numbers of students going from classes to jail cells — to look into allegations that the Broward School district has failed to spend most of the $100 million allocated to school security in a recently passed general obligation bond for district-wide campus upgrades. Additionally, a lawsuit to be filed by Anthony Borges, one of the students wounded in the shooting, is expected to claim that schools officials showed a negligently lax attitude to discipline. Borges, in a statement read by his attorney, criticized Runcie and the district's disciplinary practices last month. Still, despite the revelation Sunday, there's no evidence that the program contributed to Cruz's evolution into one of the nation's most disturbing mass murderers. 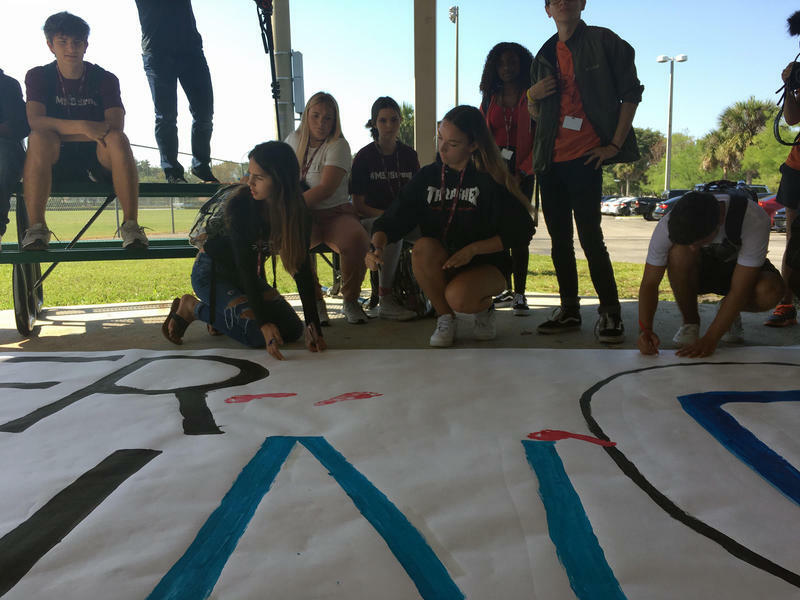 And Runcie and Broward's elected school board have remained committed to the program, which before the shooting was widely celebrated for reducing in-school arrests, expulsions and suspensions. In his defense of the program, Runcie has touted its high success rate in preventing recidivism: Nearly nine out of 10 kids who go to PROMISE don’t commit another offense at school that would send them back into the program. Runcie has maintained there’s no link between PROMISE and the shooting. The school district has hired a consultant to review the school services provided to Cruz and expects a report to be completed next month. Runcie on Twitter Monday, said more information will become available to the public as it becomes available to the school district. "We will continue to provide the best information we have at any point in time," Runcie wrote. "The independent review will be completed in a few weeks & we will share additional information at that time." McClatchy Washington reporter Alex Daugherty and WLRN Broward County reporter Caitie Switalski contributed to this report. Marjory Stoneman Douglas High School was closed for a while after the shooting on Feb. 14. And since then, some of the students have been flying around the country for rallies and media events, leading a renewed national gun control movement. 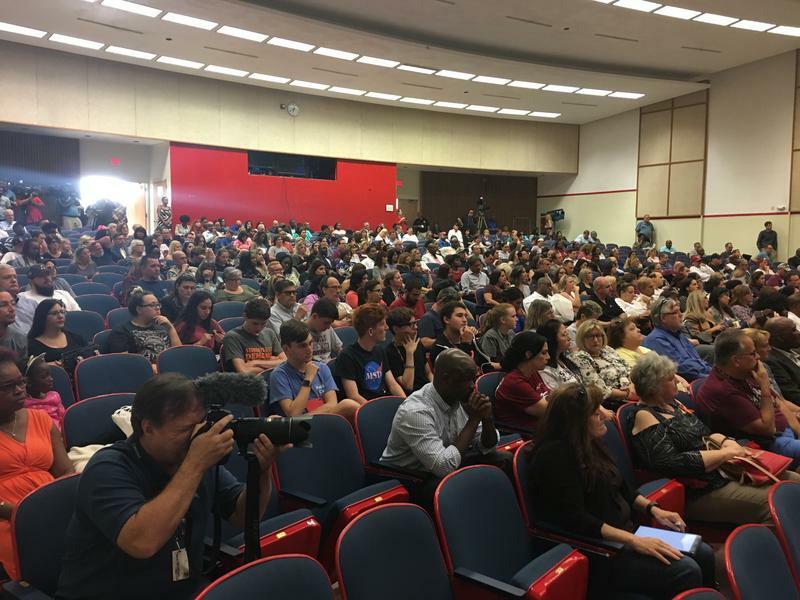 Dozens of students, parents and school staff members lined up at two microphones in the auditorium at Plantation High School on Wednesday night to share their fear and anger with Broward school district leaders.